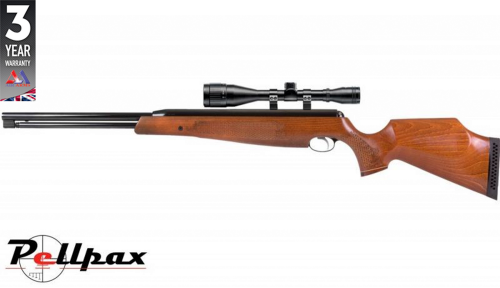 The TX200 aims for unsurpassed quality in a spring powered rifle and it accomplishes this with ease. Designed for those that like to be free from the chains of air bottles and CO2 capsules, the Mk3 TX200 provides the same level of precision as gas rifles but without the added extras. The TX200 utilises an under lever mechanism that is more accurate than its break barrel counterparts and is used by competition target shooters around the world. In fact, the rifle has won the World Field Target Championship to prove its credentials. Both reliable and smooth, the TX200 offers excellent shot to shot consistency and are product of the piston system which runs on high impact synthetic bearings which greatly reduce friction for added smoothness and consistency between shots and also greatly reduced recoil. The rifle also comes complete with an automatic safety for added security when out shooting. The MK3 also features a fully shrouded barrel that reduces muzzle noise and makes the rifle a quite capable hunter. The two stage trigger is also fully adjustable allowing you to customise your shooting experience to suit your individual requirements, be that pest control, competition shooting or even just target practice, this rifle can do it all. The fully chequered stock is made to a sporter style and effortlessly blends style and performance. The high polish finish on the action gives a rich colouration as well as adding to the protection offered from environmental conditions.